I have a 12 year old Giant Dog (Bernese Mountain Dog). Without the synovi, she cannot even stand up. Her hips are that bad. With the synovi, she runs around, plays, acts like she did when she was much much younger. Literally, she *runs* with it, and can not even remain standing without it. She has been on Synovi for over 1 1/2 years, I started giving it to her the day she couldn't stand up on her own. I've tried others, they don't seem to work nearly as well. Our 6 year old Lab mix was recently diagnosed with hip displaysia by the vet. He recommed that we try a glucosomine/conchrotin supplement before considering surgery. Our dog would some times not be able to get up and could barely walk, but with noticable pain. 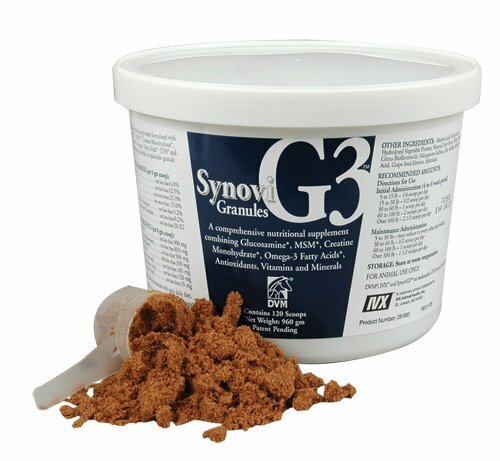 We have been using Synovi G4 granules for about 2-3 months now and the dog has not had any recurring incidents. We also started giving it to our 4 year old registered Lab as a precautionary method. We would highly recommend this product. G3s Synovi has helped our 14 year old English setter regain his ability to do stairs in our home. He was not able to climb or be comfortable lying down. For two years now, he has been able to move with greater ease and has less pain from his aging hips. Steroids could not give him the relief he has now. If your dog is suffering from joint or inflammation problems, give it a good 3 month try. I believe you will see a substantial change. I received this product extremely fast and am very happy with it.